What is the Osmo Newton game? Osmo Newton is a creative problem solving and physics game. Players solve creative physics puzzles by drawing lines or placing items in front of the screen. Newton works with any object or drawing - start with a pen and paper, mom's keys, and toys you already own. Simply place the object/drawing in front of the screen and manipulate it to guide the falling balls into the target zones. The more you succeed, the harder it gets! You can use simple strategies in the beginning, but as you progress through all 60 levels, Newton will challenge you with bouncing balls, accelerating platforms and fans that force you to think in new ways. The best way to play Newton is with the Osmo Creative Set, which not only provides players with a high quality white board surface that nests into the Osmo base, but enables players to enjoy 18 more levels of Newton too! Where is Osmo Newton? It's not in the box! To play with Newton, just download the app, and then you can use anything you want! Pen and paper, Tangram pieces, Words tiles, or any other objects you find around the house. 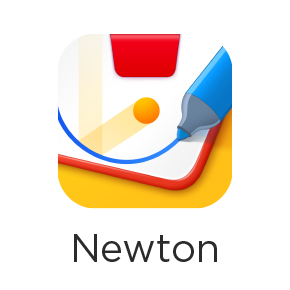 Newton doesn't require any special pieces, it's played with marker and paper or a whiteboard. Just download the app and start playing! You can use Tangram pieces, Words tiles, or any other objects you find around the house. For the best possible play experience, we recommend playing with the Creative Board. What ages is Osmo Newton designed for? Osmo Newton is appropriate for kids aged 5-11. There is no limit to how you can solve Newton levels, so even adults can use their imaginations to expand the way the game is played. What is the educational value of Osmo Newton? Osmo fosters learning in key areas such as creative problem solving, STEAM (science, technology, engineering, art, and mathematics), and common core. We believe in healthy tablet play for kids with a good balance of fun and learning with plenty of physical play away from a screen. Each of games offers unique educational value. Newton teaches creative problem solving skills and fosters social-emotional skills and creative thinking. Use your creative noggin and inventive objects like a hand-drawn basket, grandma's glasses, dad's keys, or anything around you to guide falling on-screen balls into targeted zones. Do you have instructions for Osmo Newton? What's the best surface to play Osmo Newton on? In order for the computer visioning software to be able to distinguish what is meant as an obstacle in the game, a blank and untextured background is best for the optimal play experience. All Osmo games work best on a blank white surface. What pieces are required to play Osmo Newton? That's part of the fun of Newton! Any household item can become a game piece in Newton; the possibilities are endless! Newton is special because you can use a variety of objects in the gameplay - your hands, pencils, blocks, food... anything! Why does the screen change between red and blue in Osmo Newton? When the screen is blue, the game is active. When it changes to red, it's paused for you to readjust your game pieces. You can turn this feature off in the menu by clicking the button that says “don't pause while drawing”. How do I unlock more levels in Osmo Newton? When you complete the most difficult level that's currently available, Newton will automatically unlock the next three levels. Why do the balls stop falling from the top of the screen sometimes in Osmo Newton? When Osmo detects motion, it pauses the game for you to finish changing your design. The balls will start falling again once the motion stops. You can turn this feature off by clicking the button on the left side of the menu that says “don't pause while drawing". Why should I get the Creative Set for Osmo Newton? Newton is a blast without the Creative Set, but it is a much better experience with the Creative Set. When you create a line on the Creative Board the game shows you right away how that impacts the physics on the level. Being able to learn from that result, quickly erase and adjust it makes the game more fast-paced, engaging and educational. On top of a huge upgrade to the original game we've released an entire new game mode for Newton that can only be played with the Creative Set. The Osmo Creative Set combines creative tools, games and cutting edge technology to foster creativity and problem solving skills. What do I do if Osmo Newton crashes? Any time an app crashes, it's good practice to close other open apps (double tap home button and swipe the windows up to close them). Also please try reinstalling the Newton app and restarting the iPad. If it doesn't help, please write us at support@playosmo.com with your iPad model number. You can find the model number printed on the back of your iPad.